Few films ignite as much of a passion in me as ones stemming from the Marvel Studios lot. I grew up reading those comics back in my youth, before neglecting them throughout my teenage years in favour of attempting (and failing) to bring the lady Phages running to me. They were dark times. Although I still don’t regularly read any of the comics, I’ve embraced that part of my past and really enjoy Hollywood’s attempts at bringing your comic heroes onto the big screen. And since you’re wondering – this also correlates pretty well with attracting the lady Phages too. See – comic knowledge is a pretty hot asset to behold! So, naturally Marvel’s build-up to last year’s Avengers Assemble / The Avengers was something that really drew me in and had me hooked. Every film, regardless of the relative absurdity and obscurity of the hero, landed a startlingly good direct blow! And so we come to the third instalment of the franchise that started it all: Iron Man 3. Can ol’ shellhead hold our interest for a third solo outing, or has he outstayed his welcome? The short answer? No, Iron Man has not outstayed his welcome. In fact, he’s more than welcome and encouraged to put his feet up and get comfy. You see, I’d go as far as stating here that Iron Man 3 is perhaps the best instalment in the Iron Man series of films. 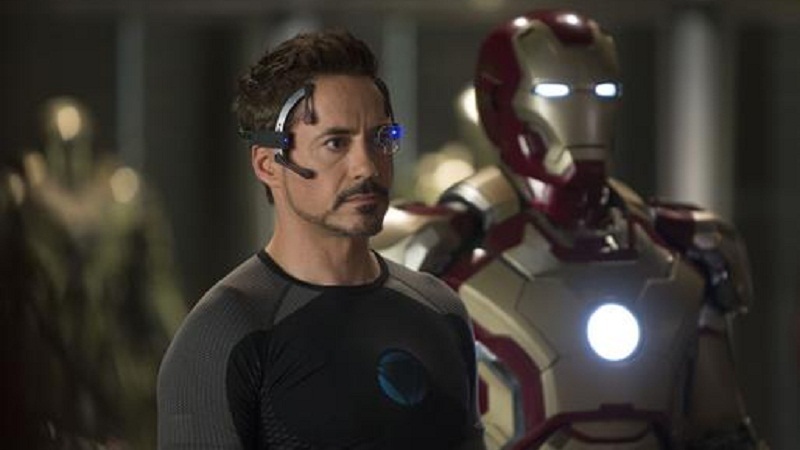 It far out-paces Iron Man 2 and at least equals, if not surpasses the canned genius of the original Iron Man. A bold statement. But what makes it so good? 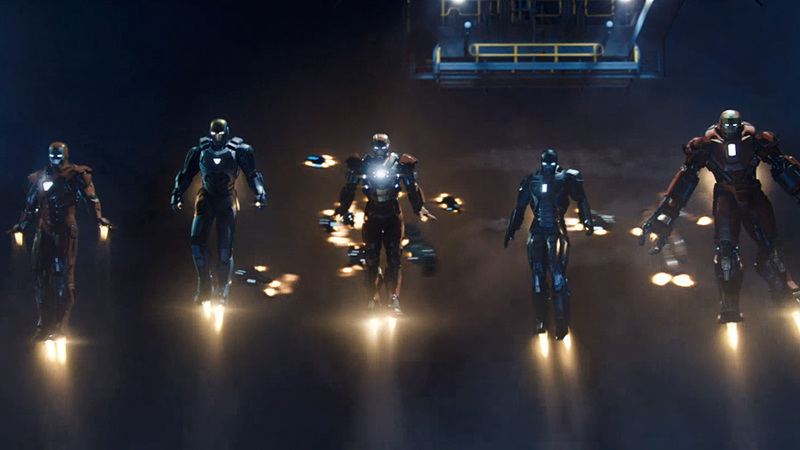 Fanboyism aside, Iron Man 3 really drills into a darker direction for the franchise, which is the key to its success. We’re all very accustomed to Tony Stark / Robert Downey Jr. cracking wise at every chance he gets. This film is, and isn’t, different. Let me explain. Much has been made in the trailers of this being a “personal” journey for Tony, who’s emotionally damaged from the events of The Avengers. Hell, he’s seen aliens, flown a nuclear bomb into space and met gods. He’s been through a fair bit! So not only does he have that to contend with, but he’s also dealing with a new terrorist threat stemming from someone known as The Mandarin (Ben Kingsley). It all gets a bit personal, which leads to Tony being the target of the aggressor’s aggression! What’s so different in this entry is the fact that we see a lot more of Robert Downey Jr. and less of the shiny red and gold suit. A LOT more Downey Jr. This is a great asset to the film. With The Dark Knight Rises, some decried the fact that Christian Bale was only in the batsuit for a small fraction of the film, as he spent a lot of time with a broken back / being an old moany guy. This isn’t the same for Downey Jr., as we actually see him having to act and not just deliver quippy lines. He goes through a lot of hardship over the course of the film, and it’s great to see this emoted on-screen for perhaps the first time in all of Stark’s / Downey Jr.‘s appearances as the character. Whilst I’m focusing on the actors, I need to give a lot of credit to both Ben Kingsley as The Mandarin and Guy Pearce as Aldrich Killian. Both are sublime in their more “fiendish” roles. As regular readers will know, I’ve got a lot of time for Guy Pearce. I thought he was great in Lockout and Lawless; he’s a very versatile actor. This is no exception. And Kingsley? Well, I was worried he might be a hammy villain as his recent performances have left a lot to be desired on the big screen, but… well, it works. You’ll see what I mean. I’m being deliberately vague, but you’ll see why when you’ve watched the film! Now that I’ve mentioned the name Aldrich Killian, I think it’s worth coming round to the source material that the film draws from. As I said at the outset, I’m still in touch with what goes on in the comic book world, even if I don’t read them any more. 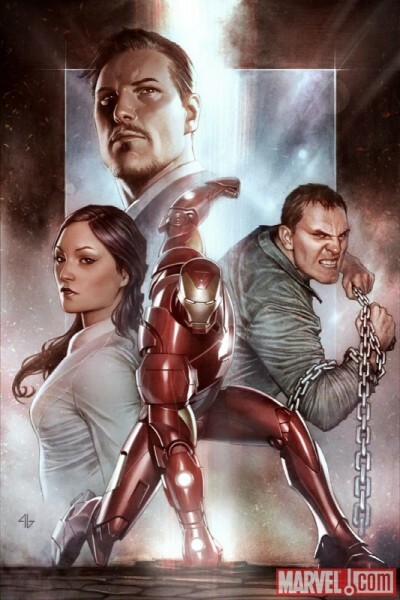 As a result of this, I’m fully aware of where Aldrich Killian and The Mandarin fit into the Iron Man mythos. Overall, the film draws heavily from the Extremis arc of the comics – Extremis is the name for a new form of weapon – essentially a way to weaponise one’s own body with untold abilities such as fire projection (seen here), or untold speed and strength. Imagine Captain America’s super soldier serum, but on a load of horse steroids. That make you breath fire. Now, the film takes liberties with this storyline in a way that involves The Mandarin and also drops some of the other interesting parts of the comic’s plot… but I won’t say what or how. I’ll leave that for you to see. So, although I’m a fan of the comic storyline, I thought it was handled really well here and adapted lovingly. So, whilst I talk of the plot, let’s mention why I’ve been so deliberately vague in previous paragraphs… there are twists. BIG twists. Twists so big that no-one would guess them, regardless of how many issues of Iron Man you’ve read. It’ll catch you totally off guard. If I’m honest, I was a little bit peeved to see the major twist, but can also appreciate it with hindsight. Let’s just say that this film isn’t going to pan out the way you expected from the trailers. I’ll say no more, nor any less. Oh, and finally… stay until after the credits. Yes, there are a TON of people listed as doing Digital Effects, but the final scene? Well, I quite like it. It’s a nice way of tying it all together. Iron Man 3 is one of the strongest outings from Marvel since they opened their own studio with the release of Iron Man back in 2008. The film feels polished, lavish and complete. It’s got a lot of pay offs for fans and also doesn’t act as a “bridge” to another movie, which is one of the major critiques levied at Iron Man 2. It’s its own movie. Its strengths lie in the scripting, direction and acting… so pretty much everything. The twists won’t be to everyone’s tastes, but I can guarantee you one thing: “you’ll… neverrrr… see… them… coming…” (to quote The Mandarin). My nerdish devotion to all things Marvel has again paid off with Iron Man 3, perhaps more so than any other movie spare The Avengers itself. My pre-teen self is elated by how good these films have turned out. And the post-teen me? Well, it’s been rewarded with a fantastic slice of modern day cinema that combines espionage, action and thriller qualities to make one hell of a film. Even the comic book geek in me is sated for now. 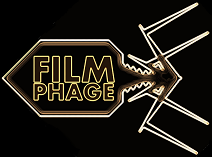 So, back to more pressing issues until Thor: The Dark World in October… where all dem lady Phages at? This entry was posted in Review and tagged 10 rings, Aldrich Killian, armours, Captain America, comics, Don Cheadle, Extremis, Guy Pearce, Gwyneth Paltrow, Iron Man, Iron Patriot, Mark Ruffalo, Marvel, Marvel Studios, Phase 2, Rebecca Hall, Robert Downey Jr., Sir Ben Kingsley, terrorist, The Avengers, The Hulk, The Mandarin, Thor, War Machine. Bookmark the permalink. Very pumped to see reviews like this!!!!! Get excited dude. Get excited. I’m one of those guys that likes to use all points in a 5 point scale, and this was a fantastic pay off to the Iron Man arc. Can’t wait to see what you make of it! I never read comics, so don’t feel as strongly about the Marvel movies. Have to say that I really enjoyed watching it, but it was just another summer blockbuster for me, one which I’ll probably will have forgotten about in a couple of months. I loved it! Your review really sells it, too. Pure from from start to finish. I’m beginning to think we’re in the minority you know. There’s a lot of disappointment out there with this film. Still, the box office takings would suggest a massive success!